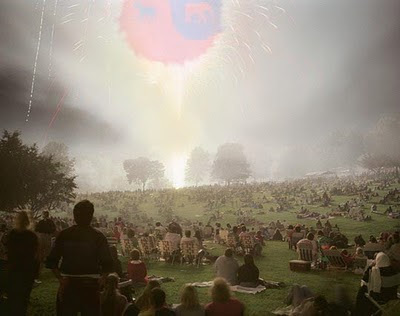 Welcome to the 38th edition of the Carnival of Divided Government - The Special Post-Independence Day Holiday Resolution To Really Get My Act Together With This Blog Edition. Yeah, I've done nothing on this blog for months and, yeah - I completely blew off the last edition of the Carnival. Moreover, I've run out of excuses. In the past I've blamed procrastination, too much fun, travel, even invoking the Hot Tub Libertarian Syndrome for my slovenly blogging habits. My only new excuse is a recent obsession with a local San Francisco political issue that has consumed a lot of blogging cycles on my other blog. What is it we so often hear the politicians say? - "Let us not be mired in the past. It is time to look forward." Indeed. An important election is fast approaching. The 2010 election is easily as important as the 2006 mid-terms, and like the 2006 mid-terms, restoring divided government will be an important electoral consideration. It is time to step up my game with this blog. No. Really. I mean it this time. As explained in earlier editions, we have adopted Latin ordinal numeration to impart a patina of gravitas reflecting the historical importance of the series. In this the Carnival of Divided Government Triginta Duodêvîgintî (XXXVIII), as in all of the CODGOV editions, we select volunteers and draftees from the blogosphere and main stream media writing on the single topic of government divided between the major parties (leaving it to the reader to sort out volunteers from draftees). Consistent with this topic, the primary criteria for acceptance in the carnival is to explicitly use the words and/or concept of "divided government" in submitted posts. A criteria that, to our endless befuddlement, is ignored by many of the bloggers submitting posts, which sadly results in DWSUWF reluctantly ignoring their fine submissions. "Congress’ approval rating is 22 percent, almost as low as the 20 percent that preceded the Democrats’ takeover in 2006 and the 33 percent that presaged the GOP takeover of 1994. Indeed, voters now marginally prefer that Republicans run the next Congress, by 45 percent to 43 percent. But asked about the parties, voters give a 9-point net negative rating to the Democrats, 35 percent to 44 percent, and a 12-point net negative to the GOP, 30 percent to 42 percent.The bottom line seems to be that an unhappy public is hoping that divided government will put the country back on the right track. But given the inability of Republicans and Democrats to agree on almost anything, there’s more reason to be pessimistic about the long term as well as the short." Morton misses an important point. The inability of Republicans to agree with the Democratic agenda of the last two years, coupled with the prospect of divided government, is a reason for real optimism. As acrimonious as the debate may be, we get better legislation when everyone has a seat at the table. Sometimes it is best to trust the common sense instincts of the voters. Pundits don't get it, but voters do - divided government will put us back on the right track. "The Resurgent memo notes that these indies have "an equal dislike for both political parties," and some believe that "divided government would only lead to more bickering." But, notes van Lohuizen, while these voters may be persuaded to come back to Obama in '12, they are "pretty well lost" to the Democrats for this fall." 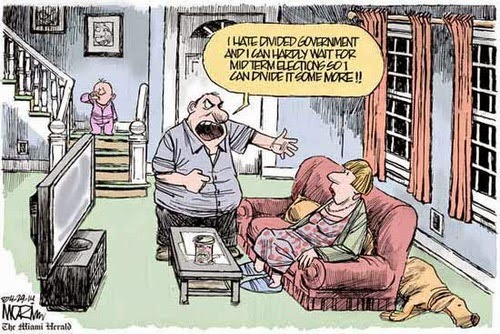 Of course divided government will lead to more bickering. That's a good thing. The advantage of divided government is that all voices are heard and have an impact on the legislation. When everyone has real power, the bickering leads to better and more fiscally responsible legislation - unlike the impotent bickering of the minority party during the Stimulus and Healthcare debates, resulting in fiscally irresponsible legislative hairballs. And if the GOP does manage to take one legislative house or the other in 2010 - this is one independent blogger who will indeed be coming back to Barack Obama in 2012. This blogger is no more interested in returning to One Party Republican Rule than he he is of continuing the current disastrous One Party Democratic Rule. "Chaos" apparently now being defined by Digby as a state when the legislative branch does their job. Oversight of the executive branch is the job of the legislative branch in our system of constitutional checks and balances. It is a job that has been completely abrogated by this lap-dog Democratic Congress, just as it was abrogated by the lap-dog Republican Congress during the first six years of the Bush administration. As I recall, Digby was much less concerned about the "chaos" that might result from Congress doing their job in the run-up to the 2006 mid-terms. Funny that. "I was pondering today the phenomenon of people who fetishize "divided government" ... 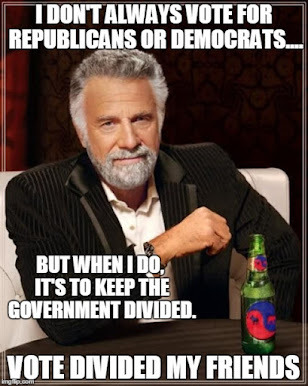 I was pondering this because some of the otherwise smart people I know who are like this (you know who you are), are seriously saying that they will vote for a generic Republican this fall, simply in order to try to get us into "divided government". This is even the case where the person believes the GOP is generally bankrupt in terms of ethics, ideas, policy prescriptions, etc. At the end of all this pondering, I was left with a question. If the merits of the people you are voting for in order to make obeisance to the Gods of Divided Government are so unimportant, would you consider voting for party of trained monkeys?" Whenever a partisan brings out a double barreled blast of full-on snark, sarcasm and derision when describing the divided government voting heuristic ("people who fetishize divided government..." "obeisance to the Gods of Divided Government...") it fills me with hope. It means the meme is getting traction and they feel compelled to (paraphrasing a recent unfortunate soundbite) launch nukes to kill ants. Pretty early for this kind of rhetoric. At the end of the post Metavirus asks for "enlightenment" about the divided government voting rationale. I'd oblige with my "Voting By Objective" post, except the tone of the post indicates a decided lack of sincerity. I think Metavirus' question is best answered with another question of equivalent intellectual heft - Would a partisan who believes the "GOP is generally bankrupt in terms of ethics, ideas, policy prescriptions, etc" vote for a Democratic Party Monkey?
" ...independent voters represent the "swing" vote, depending on whether the party in power is doing a good job and is solving problems. And, as noted, due to the lack of progress at creating jobs, most independents will be voting for a Republican/Tea Party candidate in November. Other issues will play a role, but the lack of jobs and concern about their own job security will be foremost on Independents' minds.... Further, if enough Independents vote for Republicans, the GOP will regain control of Congress, creating a divided government. Some investors argue that divided government is good for the markets and the economy, as it can 'prevent Washington from doing anything' -- which some Americans view as a good thing. The reality, however, is that given the ideological canyon between today's polarized political parties, it's a prescription for gridlock." Of course we'll get gridlock. But gridlock on needed legislation eventually ends, as it always does. And out of that gridlock we will get better, more fiscally responsible legislation than we are seeing now under One Party Democratic rule. And that is a good thing. To Joseph's larger point, I am reluctant to link longer term market behavior to any policy or partisan mix in Washington. I've not seen any studies that show a believable, statistically significant correlation between long term market direction and Republican, Democratic, or divided governments. That said - in the short term it is less important whether there really is a correlation so much as whether investors believe there is a correlation. My sense is that most investors believe the stock market will benefit from Republicans taking control of either the House or Senate in the fall. With that expectation, rising market could very well be a self-fulfilling prophecy. "Markets will also benefit from any perception that the Democrats will lose control of at least the House of Representatives. Markets like divided government because it means fewer surprises and fewer policy changes. Use any stock rallies in the next five months to raise some cash since opportunities always come along when market conditions are uncertain." Probably good advice. But if the GOP begins to look like it has a realistic chance of taking control of one house, those opportunities may come along sooner rather than later. "Even when it enjoys the support of an ideologically congenial congressional majority, a liberal administration lacks the institutional capacity to impose intelligent limits on its own redistributive aspirations. Having to reach an accommodation with an ideologically hostile opponent, as Clinton did with the Gingrich-led House, not only obliged, but enabled, him visibly to define his priorities. That doesn’t mean that what emerges from a divided government will necessarily be sensible public policy. But it will give a liberal administration the “full shape and meaning” that Noonan's looking for." True - policy emerging from divided government will not necessarily be sensible public policy. It will also not necessarily be bad public policy. However, I do believe it will necessarily be better public policy than what we get out of either One Party Democratic Rule or One Party Republican Rule. In general I like what Ron is saying here and will be looking forward to his book when he gets it out. In the meantime, I will be supporting Republican candidates in the hope that a divided government will limit Barack Obama's liberalism. And if the GOP takes either legislative house, I will support Obama's re-election in 2012 to limit GOP social conservative ideology. "During the 1990's, the nation experienced a time of unprecedented peace and prosperity, largely as a result of divided government. Bill Clinton was forced to abandon some of his more ambitious liberal goals with the election of a Republican Congress in 1994, but so too were the Republicans compelled to lay aside their more ideologically-driven aspirations. Clinton vetoed welfare reform several times before signing a version he approved of, and deals were struck that, while far from perfect, represented true sacrifice in the name of bipartisanship. " I think Matt is missing a key point in his thoughtful post. One does not need to put all the weight in the center to wind up with a balanced center. Consider the dumbbell - heavily weighted on the right and left, with almost no weight in the center, it nevertheless is balanced in the center. Think Clinton/Gingrich. Think Obama/McConnell instead of Obama/Reid -or- Obama/Boehner instead of Obama/Pelosi. "There's a slowly evolving public recognition that government has to be limited, and that individual rights have to be protected -- thus the growth of true independents, people who are distrustful of, and unrepresented by, both parties... If my guess is right, voter turnout will be historically high this year and in 2012. We'll probably have a divided government going into 2011, and if I'm correct, there'll be pressure for government to govern in a more limited fashion because of the unconsciously-libertarian influence coming from the independents. I predict this will be the beginning of a change in direction and the beginning of the end for statism. America became lazy, too trusting of government, and too apathetic because of a sense of powerlessness, but the internet and protest movements have given the public confidence in its ability to create change." That is a real double dose of optimism, prediciting a divided government in 2011 and the beginning of the end of corporate statism in America. Perhaps the key phrase here is the notion of the "unconsciously-libertarian independents". Predictable voting blocks are the difference in impotent ideas and political power. As I've outlined before, if the unconscious libertarian independent vote becomes self-aware and embraces an organizing principle that manifests some real political clout, perhap Bonzai's optimism is justified. As long as the bulk of the electorate remain polarized and balanced, even a small percentage of libertarian swing vote organized around a divided government voting heuristic will be enough for libertarians to display the biggest swinging political "hammer" in town. "From a civil liberties perspective, unified government under the Democrats is every bit as bad as unified government under the Republicans. The difference now lies exclusively in the arena of federal involvement in the marketplace. I am becoming increasingly interested in replicating the late Clinton-era split: maybe we can have the Obama administration’s adult approach to foreign policy and willingness to check demented right-wing “compassionate conservatism” in combination with a Republican Congress that will laugh every time the administration pushes for a massive new entitlement." Rojos is a friend of the blog and a member in good standing of of the 2008 Coalition of the Divided. With this post he has punched his ticket to the 2010 COD Club, which I will be posting Real Soon Now. It is astounding (and depressing) that after the hue and cry from the left about the power grab of the Bush/Cheney administration redefining the Unitary Executive, we have nothing but a deafening silence as the Obama administration continues to defend in the courts, push the boundaries, and increase the reach of executive branch power. I cannot think of a single example where this Democratic congress or administration has rolled back any of the executive branch overreach of the Bush /Cheney era since Obama came into office. The only hope for a more constitutionally circumscribed executive may be that Obama will nominate judges who will declare his actions unconstitutional. Would be raised by the Democrats’ bill. That drills oil, despite all that they kill. They’d be hurt by such law, she maintains. Such indifference to other folks’ pains! For the victims of spills? It seems oil cos have Lisa in chains. Although always amusing I don't often agree with Madeleine's liberal poetic stylings, but this gem is an exception. There is a difference between fiscal conservatism and corporate statism. The absurdly low liability cap provided by our government to this corporate giant is exactly what enabled BP's criminal negligence in the gulf oil disaster. We intend (road to hell notwithstanding) to pick up the Carnival pace in this election year as divided government content is on the increase. However, I am beginning to think that the Carnival form has seen its day as I am relying more on draftees than volunteers in these compilations. I suspect the blog will better serve the cause by posting these divided government links and comments individually as they occur on a more timely basis. For the time being, we'll try both, so look for the next edition of The Carnival of Divided Government Triginta Undêvîgintî (XXXIX)- Special Dog Days of Summer on or about 8-15-2010. Submit your blog article at carnival of divided government using our carnival submission form. Glad to be part of the carnival! :) The key to my post is the nuance you quoted above: "This is even the case where the person believes the GOP is generally bankrupt in terms of ethics, ideas, policy prescriptions, etc." As I noted in the comments back at my blog: "... Congressional Republicans are entirely uninterested in governing and, even if they were, have no compelling policy proposals on offer... it would be another thing entirely if we had a majority party and a loyal opposition with alternative ideas. then i could see divided government as possibly being a good thing. unfortunately, we have the opposition that we have, as it were, and it would be reckless to hand Republicans the keys to the country again when they've proven themselves to simply be trained monkeys that vote without integrity and with little regard to the welfare of the country." i hope we can exchange some interesting ideas on these information supertubes. Appreciate your dropping by and leaving a comment. Added the grape to the blogroll. Nuance? A predicate? yeah.... um.... No. Your comments are neither nuanced nor a legitimate logical premise. Lets call it what is: A run of the mill hard left Kos kid partisan rant. Really - it's just name calling. Nothing more. I suppose the appropriate response is throw back an Ann Coulter or RedState description of Democrats, but I suspect you've heard it before. Net net... you've answered my question in the post. Yes a partisan who hates Republicans would vote for a monkey - as long as the monkey was running as a Democrat. Not that there is anything wrong with being a partisan. On the contrary. As I have outlined here before - the potential moderate libertarian independent swing vote organized around voting for divided government will never amount to more than 5%-10% of the electorate. But that may be enough - as long as we are in a partisan political environment that is highly polarized and evenly split. As long as we have large roughly balanced blocks of Partisan Dead Weight (PDW) voting for Republicans and Democrats in every cycle, a relatively small block of truly independent swing voters with a simple to understand divided government voting heuristic to organize their vote can keep things on an even keel. But we we need that PDW - you are doing your part. I like this concept of partisan dead weight. I will have to skim through the archives to learn more. Added you to my blogroll as well. Great to make your acquaintance.